Humira claimed the worldwide sales crown from long-time champion Lipitor; the top three products are biologics for various forms of inflammatory diseases; three cancer agents from Roche place amongst the top 10 drugs. 2012 marked the first year since 2000 that Lipitor was not the top-selling prescription medicine on a global scale. The cholesterol therapy lost U.S. marketing exclusivity on Nov. 30, 2011, resulting in a significant sales decline during last year. After generating worldwide sales of $9.58 billion for Pfizer in 2010, the HMG-CoA reductase inhibitor produced 2011 revenue of $3.95 billion. Sales in Japan decreased, with Lipitor revenue for joint-promoter Astellas Pharma amounting to ¥61 billion ($644 million) for the 12-month period ended March 31, 2013, versus ¥91.4 billion ($964 million) in the prior fiscal year. Lipitor represents the best-selling prescription drug of all-time, and other products will be hard-pressed to surpass its historical sales performance. On the other hand, many of the most successful drugs in the current climate represent a variety of biologic and biotech medicines that are benefitting from a U.S. regulatory system that has produced no generic competition. Leading this wave of products is the recombinant human IgG1 monoclonal antibody Humira. Marketed worldwide by Abbott Laboratories and Eisai, Humira took over the No. 1 sales mantle from Lipitor. After ranking fourth amongst all Rx drugs with combined 2011 global sales of $8.19 billion between Abbott and Eisai, Humira’s 2012 total grew to $9.57 billion. Abbott reported $9.27 billion of that tally versus $7.93 billion in 2011, representing year-over-year growth of 16.8 percent. Humira will continue to generate strong sales growth during 2013 and beyond. The Abbott Laboratories spin-off AbbVie, which now markets Humira, reported first-quarter 2013 worldwide sales of $2.24 billion, rising 16 percent (excluding the impact of foreign exchange rate fluctuations) compared to the first three months of 2012. In January 2013, AbbVie announced that Humira is anticipated to produce low double-digit sales growth for full-year 2013. Launched in the United States during 2003, Humira works by inhibiting tumor necrosis factor-alpha (TNF-alpha). Containing the active chemical adalimumab, the TNF blocker has been approved by U.S. regulators for seven indications as of mid-June 2013. The drug is FDA-approved for reducing the signs and symptoms of moderate to severe rheumatoid arthritis, moderate to severe polyarticular juvenile idiopathic arthritis, psoriatic arthritis, ankylosing spondylitis, and moderate to severe Crohn’s disease. U.S. regulators also have cleared the biologic to treat moderate to severe chronic plaque psoriasis. More recently, in September 2012 Humira was granted marketing clearance for inducing and sustaining clinical remission in adult patients with moderately to severely active ulcerative colitis when certain other medicines have not worked well enough. AbbVie is seeking to advance Phase III development for several new Humira indications during 2013. After ranking third in 2011 and 2010, the No. 2 selling medicine of 2012 was the biologic therapy Remicade. The monoclonal antibody was introduced to the U.S. market during September 1998 and in Japan effective May 2002. Remicade global 2012 sales of $8.99 billion were accounted for by Johnson & Johnson ($6.14 billion), Merck ($2.08 billion), and Mitsubishi Tanabe Pharma ($776 million) versus a combined total of $8.86 billion for 2011. J&J reported Remicade 1Q 2013 worldwide sales of $1.6 billion compared to $1.52 billion for January-March 2012. Remicade is composed of the active chemical infliximab, which targets specific proteins in the body’s immune system to help control inflammation development. The product has been cleared by health authorities for moderately to severely active forms of Crohn’s disease, pediatric Crohn’s disease, ulcerative colitis, pediatric ulcerative colitis, and rheumatoid arthritis; active psoriatic arthritis and ankylosing spondylitis; and chronic severe plaque psoriasis. Enbrel, which competes against Humira and Remicade, was the third-best-selling drug of 2012. Approved for marketing and launched in the United States during 1998, the medication consists of the main chemical etanercept. Enbrel is marketed around the world via Amgen, Pfizer, and Takeda Pharmaceutical. Between the three companies, joint global sales grew from $7.21 billion in 2010 to $7.8 billion for 2011 to $8.43 billion during last year. FDA-approved indications for Enbrel include rheumatoid arthritis, psoriatic arthritis, plaque psoriasis, ankylosing spondylitis, and polyarticular juvenile idiopathic arthritis. Amgen reported Enbrel sales of $1.04 billion in first-quarter 2013, growing 11% versus the corresponding period of 2012. Enbrel sales for Pfizer (outside the United States and Canada) during January-March 2013 decreased year over year, falling 2 percent to $877 million. The drop-off was mainly due to the overall growth in the anti-TNF biologic market, partially offset by the unfavorable impact of foreign exchange. Pfizer and Amgen jointly promote Enbrel in the United States and Canada, with that deal set to expire during October 2013. Sales in 2012 for No. 4-ranked Advair/Seretide fell slightly compared to the previous calendar term, from £5.06 billion ($8.02 billion) to £5.05 billion ($8 billion) as registered by GlaxoSmithKline. During first-quarter 2013, global sales for the medicine rose 4 percent to £1.31 billion versus January-March 2012. The asthma and COPD drug consists of the synthetic trifluorinated glucocorticoid fluticasone and the beta 2 adrenergic agonist salmeterol. Seretide was cleared for approval in Europe in September 1998, and Advair was introduced in the United States during April 2001. The Spanish pharma company Almirall markets the drug under the brand name Plusvent, and reported less than $100 million in annual sales for each of 2010-2012. According to GlaxoSmithKline, the timing and impact of entry in the United States and major markets in Europe for a ‘follow-on’ product to Advair/Seretide consisting of the same main chemicals is uncertain. The U.S. patent for compositions containing the combination of active ingredients in Advair expired in 2010. 2012’s No. 5 seller Abilify is available for adult patients with schizophrenia, bipolar mania disorder and major depressive disorder. The atypical antipsychotic agent additionally has pediatric uses in schizophrenia and bipolar disorder, among others. Bristol-Myers Squibb and Otsuka Pharmaceutical collaborate on the drug’s worldwide commercialization. Combined Abilify sales between the two companies totaled $7.45 billion during 2012, $7.1 billion in 2011, and $6.71 billion for 2010. The basic U.S. composition of matter patent covering Abilify’s main ingredient aripiprazole runs out during April 2015 (including the granted patent term extension and six-month pediatric extension). A composition of matter patent is in effect in Germany, the United Kingdom, France, Italy, the Netherlands, Romania, Sweden, Switzerland, Spain and Denmark. The original expiration date of 2009 was extended to 2014 via grant of a supplementary protection certificate in all of the aforementioned countries except Romania and Denmark. Data exclusivity and the rights to commercialize in the European Union run their course in 2014. Data exclusivity in Canada expires during 2017. After experiencing a sales decrease from 2010 to 2011, Rituxan/MabThera’s market performance rebounded during 2012. The medicine climbed from the No. 8 ranking for 2011 to sixth place for last year. Sales went from SFr6.36 billion ($6.78 billion) in 2010 to SFr6.01 billion ($6.4 billion) for 2011 to SFr6.71 billion ($7.15 billion) during 2012. Rituxan/MabThera is available for non-Hodgkin’s lymphoma, chronic lymphocytic leukemia, rheumatoid arthritis, as well as granulomatosis with polyangiitis and microscopic polyangiitis, which are two forms of ANCA-associated vasculitis. Roche reported Rituxan/MabThera sales of SFr1.7 billion during first-quarter 2013, up 6 percent compared to 1Q 2012. Sales improved due to increased use of the drug in the first-line maintenance treatment of follicular lymphoma, a type of non-Hodgkin’s lymphoma (NHL), in the United States and Europe. According to Roche, there was increased demand in China for Rituxan/MabThera to treat diffuse large B-cell lymphoma, another form of NHL. Crestor became the worldwide sales leader among cholesterol-management medications in the post-Lipitor reign. The rosuvastatin-containing statin is used for treating dyslipidemia and hypercholesterolemia. In some markets, the brand is additionally indicated to slow the progression of atherosclerosis and to reduce the risk of first cardiovascular events. Marketed by AstraZeneca and Shionogi, Crestor worldwide sales declined from $7 billion for 2011 to $6.66 billion during 2012. Crestor’s 2012 U.S. sales were up 3 percent to $3.16 billion, and with reported 4 percent growth in Japan by AstraZeneca the drug took over as the leading brand in the statin market there. Crestor’s overall global sales growth for AstraZeneca, however, declined due to the performance in other regions such as Canada, where the product lost exclusivity during April 2012. According to AstraZeneca, Crestor’s 2012 U.S. performance showed resilience in the face of the November 2011 market entrance of a generic version and, from May 2012, various generic forms of atorvastatin. During 2012, Crestor became the most prescribed branded pharmaceutical in the United States. Crestor is the only statin with an atherosclerosis indication approved by FDA that is not restricted by disease severity or limited to patients with coronary heart disease. In December 2012, AstraZeneca announced that the Court of Appeals for the Federal Circuit upheld the decision of the District Court, District of Delaware, finding that the U.S. substance patent protecting Crestor is valid and enforceable. Absent a reversal of this decision, none of the filed Abbreviated New Drug Applications may be FDA-approved before expiration of the ‘314 patent. The ‘314 patent for rosuvastatin calcium expires during 2016. Lantus (insulin glargine) is the world’s top-selling diabetes medication. The long-acting analog of human insulin is indicated for once-daily subcutaneous administration in treating adult patients with type 2 diabetes who require basal insulin for the control of hyperglycemia, and for adult and pediatric patients 2 years and older with type 1 diabetes. Available in more than 120 countries, Lantus is the No. 1-selling insulin brand in sales and units globally. For marketer Sanofi, Lantus produced 19.3 percent growth in net sales at constant exchange rates during 2012 to EUR4.96 billion ($6.38 billion), placing the drug at No. 8 in worldwide sales. This performance was spurred by a 22 percent improvement in U.S. sales to EUR3.09 billion; 25.4 percent growth in Emerging Markets to EUR793 million, including growth of 35.9 percent in China and 32.3 percent in Latin America; and a 22 percent increase in Japan. During first-quarter 2013, the medicine continued to perform strongly, with global sales advancing 21.3 percent year over year to €1.34 billion. Lantus is the most studied basal insulin with more than a decade of clinical evidence in diabetes treatment and a well-established safety profile. The product’s U.S. compound patent expires in August 2014, with protection extended to February 2015 by pediatric extension. 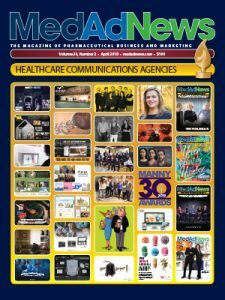 Lantus has been recognized by Med Ad News editors as Medicine of the Year; for more details, please see the cover story. The breast and stomach cancer drug Herceptin ranked No. 9 on the top-selling prescription medicine list of 2012. Roche reported Herceptin global sales of SFr5.89 billion ($6.28 billion) during 2012, which was a 12.1 percent improvement over the 2011 amount. For first-quarter 2013, the drug produced worldwide sales of SFr1.57 billion, representing 11 percent growth over its performance in January-March 2012. A humanized monoclonal antibody containing trastuzumab, Herceptin is designed to target and block the function of HER2 – a protein produced by a specific gene with cancer-causing potential when it is overexpressed. Herceptin’s mode of action is unique in that the drug activates the body’s immune system and suppresses HER2 signalling to target and destroy the tumor. The medicine has shown unprecedented efficacy in treating early and advanced (metastatic) HER2-positive breast cancer. Administered on its own as monotherapy as well as in combination with or following standard chemotherapy, Herceptin has been demonstrated to improve overall survival, response rates and disease-free survival while maintaining quality of life in women with HER2-positive breast cancer. The product is marketed in the United States by Genentech, in Japan by Chugai Pharmaceutical, and internationally by Roche. Since 1998, Herceptin has been used to treat over 1.2 million people with HER2-positive cancer around the globe. Avastin was one of three Roche oncology drugs to crack the top 10 medicine list of 2012, coming in at No. 10. The Swiss company reported Avastin 2012 worldwide sales of SFr5.76 billion ($6.15 billion), increasing 9 percent over its 2011 sales. The product’s 1Q 2013 sales rose 11 percent versus first-quarter 2012 to SFr1.53 billion. Initially FDA-approved for advanced colorectal cancer during February 2004, Avastin became the first anti-angiogenic therapy made widely available for treating patients with an advanced cancer. Avastin continues to transform cancer care via the drug’s proven survival benefit (overall survival and/or progression free survival) across several forms of cancer. The medicine is marketed in the United States for treating colorectal cancer, non-small cell lung cancer and kidney cancer. Avastin is available in Europe for treating advanced stages of breast cancer, colorectal cancer, non-small cell lung cancer, kidney cancer and ovarian cancer. The product also is approved in the United States and in more than 60 other countries for treating patients with progressive glioblastoma following prior therapy. The drug is marketed in Japan for treating advanced stages of colorectal, non-small cell lung cancer and breast cancer. According to Roche, Avastin is the only anti-angiogenic therapy marketed for treating these numerous advanced cancer types, which collectively result in 2.5-plus million deaths per year. More than 1 million patients have been treated with Avastin. A comprehensive clinical program with over 500 continuing clinical studies is investigating the use of Avastin in more than 50 tumor types.